The choke of fog on the air…The taste of fear, more bitter than any almond…Who can save the British Empire of Great Britain in its hour of need? 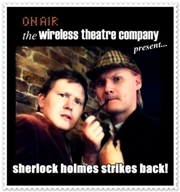 For one night only The Wireless Theatre Company resurrected the world’s greatest detective partnership for a live audio recording; Sherlock Holmes Strikes Back! Sherlock Holmes Strikes Back! Takes you on a funny, fast-paced adventure against some of England’s deadliest foes, with all the excitement of a live radio recording. Starring: Peter Davis, Matthew Woodcock, Panny Skrivanos and Laura Marshall. LEAVES IN AUTUMN - (COMEDY/DRAMA) Iris hadn’t clapped eyes on Jerry, the 18 year old boy who’d swept her off her feet in 1966 for forty-three years, until a chance meeting at a funeral. Will their romance be rekindled? The Wireless Theatre Company.